Adaptive content. Omni-channel marketing. People-first marketing. Personalized marketing. Personalization. Whatever you want to label it, they all speak to a similar concept: the idea that data and technology can be used to deliver a more tailored experience for consumers, and in turn, a more-effective one, regardless of what device they are on. Organizations on all sides of the advertising landscape are investing in personalization tools. Ad tech vendors, agencies, publishers, ad networks, and exchanges are readjusting their value proposition to emphasize their ability to help advertisers use this technology to reach their customers more effectively. For example, Atlas is now a people-based marketing solution powered by Facebook. Five years ago, the word “people” was not in its messaging. Atlas was a “world-class media measurement platform, delivering billions of impressions every day.” (This information was retrieved from the Wayback Machine Archive.) This evolution reflects that of the industry. We now realize technology’s value isn’t measurement; measurement is the conduit into understanding. Tailoring messages by channels, understanding customer behavior over time, and matching customers across multiple devices are now top priorities for the vast majority of marketers (76 percent, 75 percent and 74 percent, respectively), according eMarketer’s recent survey, “Customer Acquisition in the U.S.: A focus on Data, Audience and Lifetime Value,” October 2016. But doing so isn’t easy. The same eMarketer research found that less than 15 percent of respondents feel their organization is capable of delivering on any of the aforementioned priorities. The technology is there. So are the intentions. What is the holdup? While advertisers are sold on personalized marketing’s value, many haven’t quite figured out what it means in practice. They have invested in tools for collecting data about their audience. They know how to find the right person, and they can update their creative appropriately, but managing all of these moving parts and creating and implementing an overarching strategy is challenging. Brands can’t wait much longer. If they don’t start speaking to customers like real people, they will lose out to competitors who do. Even unlikely brands like Hunt’s get this. The tomato brand has recently been using its data management platform (DMP), Krux, to target environmentally conscious consumers with messages focused on Hunt’s sustainable practices. The content shows how Hunt’s offers organic tomato products, and how it uses a natural non-chemical process to peel its tomatoes. Crystal Light is also ahead of the curve when it comes to personalization. The brand uses its first party data to target website visitors who are looking at weight loss or health tips—they use personalized ads with themes like “zero calories.” Using third-party data, the brand can also learn other interests, like fashion. They can use this data for a Crystal Light message like “add a pop of color”—linking the act of using the drink mix to a fun concept in fashion. For brands marketing to millennials and building trust is paramount. Most millennials do not trust traditional advertising. They trust their peers and friends more than brands, corporations, and even experts, thus the popularity of user-generated content and influencer marketing. If you are not marketing to millennials, you will be soon. They are the next big consumer force. Your marketing communication has to sound less like a corporation and more like a trusted friend. That means fewer sweeping generalizations and more personalized messaging based on insights. People-first marketing is about communicating with audiences more like the way their peers do. This helps you earn their attention and foster trust. Obviously, millennials aren’t all the same, but many brands’ personalized marketing does not reflect that. One of the biggest mistakes advertisers make is failing to segment the generation further. (There are six, seven, or maybe 12 types of millennials.) If your so-called millennial messaging doesn’t actually resonate with the recipient, it won’t help you build trust, and it is not really personalized. The gap between companies’ intentions and their actual execution comes down to two things—either they haven’t adopted the needed technology or they haven’t been able to successfully implement it. 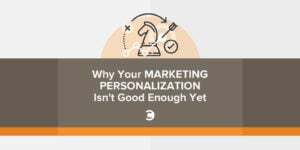 Personalization technology, for all of its automation, is not simply plug-and-play! It is tempting to think that your job ends after you’ve made the decision to invest in technology, but it takes attention to use it effectively and to determine how to make it fit with existing processes. Brands need to consider the importance and long-term impact of personalization, evaluate it against other projects, and prioritize appropriately. They need to take the time to activate their investment, understanding that such a shift takes time, focus, and resources. Remember, audience targeting is different than just testing ad images and font colors. That is basic conversion rate optimization. Putting your audience first means really understanding them and updating your content to reflect that. Analysis paralysis is certainly contributing to the implementation lag. It is challenging to figure out what observations matter and what traits should actually impact your targeting and creative strategies. Audience personalization should not happen in a vacuum. Use all the information at your disposal, including Google Analytics, Facebook Insights, email lists, past marketing campaigns—everything you have learned about your audience. All this data makes it hard to see the forest. It can also be challenging to figure out who within your organization should be leading the way. You can’t hand your creative team raw data and ask them to run with it. You have a media team, analysts, and tech experts working with your DMP, but are they turning the data into something that can be used upstream? Workflow issues are also contributing to the holdup. All areas of your company need to get on the same page and speak the same language. For the uninitiated, there’s a fairly easy way to get started with message personalization. Run a split test with different values that your company provides. For example, a hotel brand might have two stories to tell: one that focuses on value for travelers on a budget, and another that is about the luxury and comfort of their accommodations. By split testing an email or ad creative to a broad audience with both messages, they can start to see where these messages resonate, and use the results to further personalize messages to those same groups in the future. The industry has agreed on the value of personalization and invested in the technology needed to make it happen. The potential ROI is clear. Now it is about focus and embracing your tech stack, as well as your ability to do something with the information you’ve gathered. It is up to the advertiser to activate the data and targeting tools it has invested in. People-first marketing means using technology to think like a human, which can be surprisingly challenging but is crucial to a brand’s continued marketing success. Rob Lennon is a senior product marketing manager who excels in the disciplines of product strategy, sales enablement, marketing automation, content marketing, and user experience. He is an expert in developing growth strategies and demand generation, with extensive experience marketing enterprise B2B SaaS products to advertisers, agencies and publishers.